Kangana Ranaut and team Manikarnika are clearly enjoying the kind of response the recently released teaser of the film has been receiving. The teaser of Manikarnika has garnered over 12,183,795 views within a day and this is a reason big enough to celebrate. Team Kangana Ranaut shared photos and videos of the cast celebrating the "stupendous" response to the teaser. 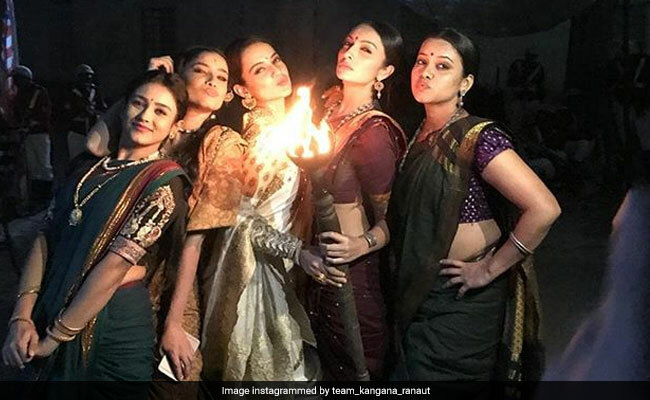 In one of the photos shared on Instagram by her team, Kangana Ranaut can be seen posing with co-stars Ankita Lokhande, Unnatii Davara, Mishti Chakravarty and Priya Gamre. A boomerang video featuring the actresses has also been shared on Instagram. Another post suggests that Kangana had a small cake cutting session with Manikarnika team to celebrate the successful launch of the teaser. The teaser of Kangana Ranaut's Manikarnika: The Queen Of Jhansi released on Gandhi Jayanti and it managed to get a thumbs up from netizens. Directed by Radha Krishna Jagarlamudi (Krish), Manikarnika is the biopic of the Queen of Jhansi, who shines as a significant figure on the pages of Indian history for her rebellion against British Raj in 1857. The teaser features Kangana as a warrior queen, who valiantly fights against the East India Company. The teaser is replete with jaw dropping action sequences and Kangana like always is just nailing each bit. Kangana Ranaut in an earlier interview to news agency IANS had said that she is "extremely proud" of Manikarnika. "I am extremely proud of this film, portraying a character who empowers and inspires. We have put in our heart, blood and sweat into making this film. Manikarnika will make each and every Indian proud," Kangana told IANS. Kangana has also directed a few portions of Manikarnika after director Krish got busy with another project. Co-produced by Kamal Jain, Kangana Ranaut's Manikarnika: The Queen Of Jhansi hits the screens on January 25, 2019.